(100 years) ,strong and durable moderate in cost ,easy to join . break during joining or transportation .These pipes are used as distribution Main . 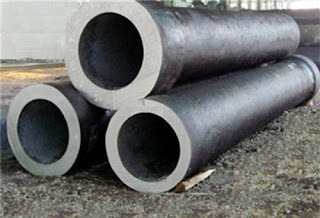 These pipes can withstand high pressure as they are strong in tension but can not take heavy external load or vacuum . Hence these pipes are used as pumping main . These pipes are susceptible to corrosion ,have high maintenance cost and shortened life ( 25 - 50 years) . These pipes are light weight hence offer low transportation cost . These are not used as pressure pipes but are used to carry sewage and drainage at partial depth . These are free from corrosion and provide a smooth hydraulically efficient surface . These pipes are light hence easy to transport .These are highly resistance to corrosion ,highly flexible thus requires less joint in their layout. They provide a smooth hydraulically efficient surface and their discharge carrying capacity do not reduce with time.They are costly ,week, brittle and soft hence are liable to get damaged during transportation. They can withstand acidic and alkaline action of water. These are thin steel pipes coated with cement mortar from inside using centrifugation . These are highly resistance against corrosion.